In 2008, CBS' Chief Foreign Correspondent, Lara Logan, candidly speculated about the human side of the war in Iraq: "Tell me the last time you saw the body of a dead American soldier. In 2008, CBS' Chief Foreign Correspondent, Lara Logan, candidly speculated about the human side of the war in Iraq: "Tell me the last time you saw the body of a dead American soldier. What does that look like? Who in America knows what that looks like? Because I know what that looks like, and I feel responsible for the fact that no one else does…” Logan's query raised some important yet ignored questions: How do the remains of service men and women get from the dusty roads of Fallujah to the flag-covered coffins at Dover Air Force Base? And what does the gathering of those remains tell us about the nature of modern warfare and about ourselves? 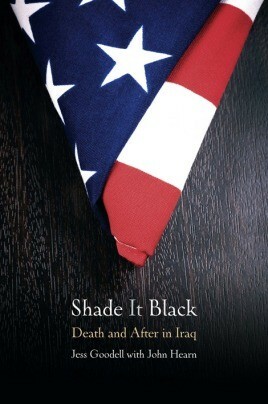 These questions are the focus of Jess Goodell's story, Shade it Black: Death and After in Iraq. Jess enlisted in the Marines immediately after graduating from high school in 2001, and in 2004 she volunteered to serve in the Marine Corps'first officially declared Mortuary Affairs unit in Iraq. Her platoon was tasked with recovering and processing the remains of fallen soldiers. This insightful memoir describes the challenges she faced, both in terms of gender discrimination and the alienation felt by all members of the MA, who were sometimes avoided by others. In short, a defining wartime experience which should never be forgotten. In this absorbing memoir, Iraq veteran Goodell recounts her service, the brutal, sexist culture of the Marine Corps, and her struggle to adapt to the world upon her return from Iraq. After enlisting, Goodell volunteered to serve with the Marines' first declared Mortuary Attachment in Iraq's Al Anbar province, in 2004. The Mortuary Attachment platoon was responsible for doing "what had to be done but that no one wanted to know about": they "processed" the bodies of U.S. and other soldiers killed in combat, so that they could be identified and returned to their families. She describes in gruesome detail what this involved, and how it affects the soldiers who care for their comrades in this way. She rubbed up against a Marine Corp culture that includes routine indignities ...outright misogyny ... and sexist marching cadences. Coming home, unable to gain weight or sleep or relax and unprepared for post-service life among a population that had no idea of who she was or what she had gone through, Goodell began to come apart. Her memoir is a courageous settling of accounts, and a very good read. Jess Goodell's Shade It Black is a must read for anyone seeking "the ground truth" about what it is like for a woman to join, train and serve as a US Marine, particularly in theater. Her deeply personal account about deploying for a year with a Mortuary Affairs unit offers a unique and fresh perspective on the Iraq war. The story is especially relevant when the unit returns home to find that their experiences continue to haunt them. Goodell describes a heart-rending lack of support from the Armed Services in dealing with the psychological issues that surface after discharge from the military. This book is not for the faint-hearted but it is chock full of provocative compelling, memorable writing about what it is like to be a female in the fiercely male culture of the Corp and then a veteran in a society that takes little or no ownership of the war. Shade it Black is hard to pick up and difficult to put down. It is an unfathomable account of the horrifying and unimaginable experience of being a woman marine in the mortuary affairs unit. That Jessica can function and write this account is a testament to her strength and endurance but the problems she experienced when returning to civilian life clearly underscores the desperate need for services specifically tailored for women veteran's unique physical and psychological needs.